Best for a group of youngsters or even a few adults, this model offers features and an exceptional weight limit that will provide long-lasting fun. A trampoline is a great way to spend some quality with your loved ones. About 30 years ago, getting the best trampoline was almost impossible, as there were only a few manufacturers that offer high-grade designs and technologies. However, today, you can go through a wide variety of brands that the market has to offer. Trampolines are full of fun, especially when used by the kids. It is a perfect way to getting your family out into the yard while getting them off the couch. In fact, trampolines are useful tools in shedding some of that excess fat, surely a fun way to exercise! It can eliminate having overweight family members. Trampolines typically come in one of four shapes. Rectangular. This shape provides more jumping space and higher jumps. They are primarily used for gymnastics. Round. This is the most common shape used for backyard models. Square. Square models are similar to rectangular models, but they don’t produce quite as high of a bounce. Octagonal. These models are also great for backyard use. They provide a larger jumping area and a bit of a higher bounce than the round models. Their straight edges also make it easier to jump. The best trampolines can be purchased virtually anywhere, especially through online shopping as there are several dealers of this fun stuff. 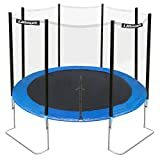 So, below are the top rated trampolines that will help you on your journey of finding the best deals to fit your needs. 53.5 x 19.9 x 10"
153.2 x 76.4 x 19.9"
180 x 180 x 108"
Trampolines are great fun for kids and adults of all ages. With an average rating of 4.5 Stars is the Stamina 36 inch Folding Trampoline that totally offers efficiency, safety, and a progressive way to exercise. Among the top rated trampolines today, the Stamina features a unique, folding design that results in a smaller component when not in use. This feature provides the user with the ease of storage and maintenance simultaneously. Besides the limited one-year manufacturer’s warranty, this trampoline also features its thirty-band tension resistance, with the bands measuring at 2 inches wide each for improved stability and durability. This trampoline is made of all-steel frame construction with 6 detachable rubber-tipped legs, including a heavy-duty rebounding surface with a safety pad. Trampoline comparison would indicate the benefits of rebound training over the traditional approach. While rebound training is very challenging, it is likewise easy on the joints, resulting in a slow progress, according to the jumper’s speed. 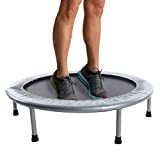 At-home fitness enthusiasts can certainly take advantage of this trampoline and the benefits of rebound training, creating a cardiovascular routine, rather than expensive equipment as trampolines only require an open spot. Among the health benefits of rebound training include an improved oxygen circulation to the body tissues, stimulate metabolism, reduce the likelihood of obesity, lower cholesterol and triglyceride levels, and improve the overall coordination throughout the body. Therefore, the Stamina 36 inch Folding Trampoline can aid in achieving these health goals. The users are guaranteed not only health benefits but also high quality with this type of trampoline. Stamina is among the trusted trampoline brands to date with its establishment way back in 1987, although it is a founding company in developing ‘infomercial’ products. Overall, the 36-inch Folding Trampoline from Stamina offers unmatched safety, efficiency, and durability, packed in one, providing every family a healthy way to become fit without spending too much. 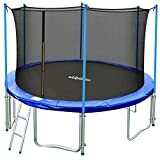 With a 4.5-Star Rating on Amazon is the Skywalker Trampolines 15-Feet Round Trampoline and Enclosure with Spring Pad. This is the best outdoor trampoline you’ll find on the market today. It features reinforced T-sockets, which stabilize the upper enclosure frame to the main trampoline frame while preventing structural twisting. The trampoline frame is constructed of heavy gauge galvanized, rust-resistant steel, having six W-shaped legs for extra stability. It also features a Stay-Put enclosure net, interlocking to the jumping mat via a patented button-hole feature, which attach the enclosure netting to the jumping surface at each V-ring. This entire mechanism tends to eliminate gaps. When assembled, the trampoline measures at 15ft by 15ft by 9.5ft and has 200-pound weight capacity. Trampoline reviews highly recommend this Skywalker for ages six and above. This 15-foot trampoline’s enclosure combo can keep your kids both active and entertained at the same time. The secured, uni-bodied frame results in a gap-free design, eliminating ropes and threads. The Skywalker Trampolines 15-Feet also offers the traditional rectangle shape, but long straight sides, which make it perfect for aspiring gymnasts, competitive jumpers, and just for pure family fun. The materials used in this top-rated trampoline are durable, UV-protected materials, increasing weather resistance. 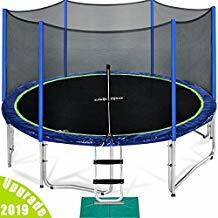 It also provides the highest lifts, compared to traditional round trampolines because the springs work at different rates, providing the jumper with more control over the height and landing. The weather-resistant feature of this trampoline makes it the best backyard trampoline for families to enjoy the outdoors for years to come. All in all, the Skywalker Trampolines 15-Feet Round Trampoline and Enclosure with Spring Pad is the safest trampoline for kids as young as six, but also ideal for adults alike. The durable materials and weatherproof characteristics of this best trampoline for kids will help families spend quality time and create memories that will last a lifetime! The Skywalker Rectangle Trampoline with Enclosure, 15-Feet is among the best rated trampolines on Amazon, garnering an average of 4.5-Star Rating. Similar to its brother, this trampoline is also made of galvanized steel frame, including reinforced T-sockets that can stabilize the upper enclosure to the main frame, while avoiding structural twisting. The button-hole feature interlocks the enclosure net to the jumping mat. The enclosure net is made of high-grade polyethylene material, increasing UV protection and durability at the same time. The UV protected spring is extra wide and filled with 1-inch thick foam padding that adds comfort. 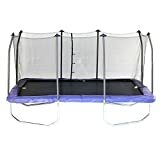 Reinforced stretch bands are used in attaching and securing the spring pads, jump mat V-rings, and the trampoline frame. Perhaps, this is the best trampoline to buy, considering its patented Stay-Put enclosure system, a no-gap design that eliminates the dangerous gaps between the jumping surface and the enclosure net. Hence, little fingers and toes are safe from pinching and other unwanted injuries. The no-gap system also offers an easy assembly and minimal maintenance due to the absence of thread ropes. The Skywalker Rectangle Trampoline also boasts a thick, UV-protected spring pad for added safety and comfort as kids tend to climb on and off the main trampoline. The springs are situated on the outside of the trampoline’s enclosure. Aside from the galvanized steel construction, rust-resistant springs, and padded enclosure system, this best rated trampoline also features a dual enclosure system with dual zipper and latch clip closure, keeping the users safely inside, while jumping. The trampoline offers an even bounce, which is excellent for gymnasts as it has a rectangular shape, unlike the common round counterparts. This product from Skywalker also meets the American Society for Testing and Materials (ASTM) Safety Standards, ensuring thorough testing of its safety and durability. Finally, the Skywalker Rectangle Trampoline has an ASTM-approved weight capacity of 250 pounds. 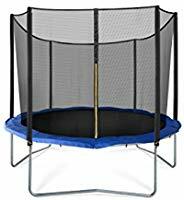 The 15′ Ft 6W Legs Trampoline w/ Safety Pad and Enclosure Net and Ladder All-in-one Combo Set from ExacMe garner an average rating of 4 Stars on Amazon. 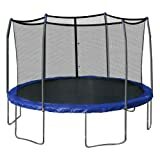 The trampoline safety ratings of this item are TÜV certified, UV testing and GST testing approved. This trampoline features six W-shaped legs as well as 12 balanced contact points for added stability. The best outdoor trampoline reviews would likewise indicate that 6W legs trampolines are far much better than the 5W and 4W leg counterparts. This set also includes a ladder and the assembly size measures at 15ft by 15ft by 9ft. The sturdy ropes and straps can secure the net to the trampoline itself. The net door has a zipper for easy opening and closing. In all, this trampoline has 375-pound weight capacity, which is the highest weight capacity on the market today. Exacme trampolines are known by many consumers across the globe, considering that it is a reliable name when it comes to trampoline makes. This brand of trampolines ensures strong and durable rust-resistant galvanized tubing. This material is safer and can last longer than welded trampolines. The trampoline’s six U-shaped legs, along with the 12 balanced contact points improve its overall stability. This design also prevents tipping or wobbling, while adding more weight capability. The galvanized springs offer a deeper and more exciting bounce. All the more, this item does not require any tool or any skills during the assembly. Similar to the above-mentioned trampoline, the 15′ Ft 6W Legs Trampoline meets the ASTM, GS, and TUV quality and safety requirements. So, there is no doubt that this is among the top rated trampoline brands on the market with a heavy-duty, rust-resistant frame that is great for the outdoors and can last up to years of use. Furthermore, the net enclosure is perfect for creating a fun jumping experience without limiting the visibility. Thus, all materials are durable with security features that can level up the ante of fun and safety at the same time. The Ultega Jumper Trampoline with Safety Net receives a 4.5 Star Rating, having the galvanized steel base and frame that prevent the entire thing from tipping over. This trampoline has up to 200 pounds of weight capacity and is the latest trampoline in its price bracket. Among the highest rated trampolines today, the Ultega Jumper features a safety net, including eight padded poles that can deliver the highest safety level. The mat is attached to the main frame through 88 springs. A high quality of net surrounds the whole jumping area, offering maximum safety for both small and big jumpers. Certainly, ‘trampolining’ is more fun for kids and adults alike with the Ultega Jumper Trampoline, an unmatched opportunity for parents and children to have quality time. Thus, it is likewise a great way to improve health as trampolines are said to enhance the cardiovascular health, balance, and motor skills. 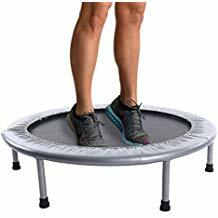 This is a perfect trampoline that also offers coordination training through targeted exercises, such as a 10-minute jumping session, which is equivalent to a 30-minute jog. Purchasing the Ultega includes a set of 5 diagrammed step-by-step instructional guide, allowing the users to make the most of the workouts. The jumping exercises also include an instruction manual, for children and adults alike, helping them improve their balance, flexibility, and coordination all at the same time. Rest assured that the Jumper Trampoline with Safety Net from Ultega equates to reliability as the company has been trusted by millions of consumers worldwide. Since 2011, the company has introduced a lineup of products in the categories of fitness, leisure, and outdoor sports. Thus, it has been successful with its lineup of trampoline makes. An Ultega purchase also comes with a limited 2-year manufacturer warranty, protecting the customers from defects in workmanship and materials. Overall, the brand is exclusively selling its products on Amazon, ensuring no less than genuine products on the market. The Zupapa 15 Ft Trampoline receives an average rating of 4.5 Stars on Amazon, and many customers take home this trampoline as a way of safe entertainment for the whole family. Primarily, the Zupapa is certified by TÜV, a German organization that works in validating the safety of products, while protecting the consumers and the environment against hazards. This independent consultant examines and monitors products, thus, with the Zupapa TÜV-certified trampoline, safety is assured. Moreover, the Zupapa 15 Ft Trampoline features longer net poles, plus two steel joints. Each leg and pole is attached tightly in two places, making sure that the entire trampoline is firm and safe. This mechanism also prevents the unwanted structural twisting. Among the top 10 trampolines on the market, Zupapa products are constructed with real, heavy-duty steel frame. Hence, this Zupapa trampoline measures at 42mm in diameter, while it is made of rust-resistant galvanized for a stronger structure. Instead of the common 60 springs, this trampoline offers 71 galvanized springs, while the added 12 makes this lineup super stretchy, safer, and more comfortable. This could be the best trampoline, considering the heavy gauged 7-inch springs that provide an optimum bounce. The jumping mat is also made of heavy-duty and UV-protected polypropylene, resulting in an improved durability and strength. The blue mat is a combination of PE and PVC FOAM pad with a thickness of 20mm. The jumping mat is perfect protection and provides longer service life. Aside from the 330-pound weight capacity of this trampoline, potential buyers can likewise enjoy jumping accessories, including a safety enclosure, galvanized steel ladder, shoe bag, and rain cover. Similar to other top rated trampolines, the Zupapa Trampoline is very easy to assemble, without the hassle of drilling, whatsoever. In all, this trampoline is a safe way for families to enjoy and exercise and is highly recommended due to its TÜV certification. Planning is a crucial step, before purchasing anything. The same is true when buying the best trampoline. Caution is equally important as there are product dealers that are deceitful. Keep in mind to prioritize your family’s safety before anything else, especially with these types of products that will be used mostly by children. Therefore, consider the factors below that affect your decision-making throughout your purchase of a trampoline. There are backyard trampolines that will cost less money. These trampolines are usually smaller in size and are geared towards small exercising routines, costing about $50. However, a 7-foot in diameter trampoline with a safety net would probably cost around $129, offering added safety and protection. Those with enclosure will cost about $250. Regardless the cost, make sure that you are purchasing a trampoline with safety features, making these types worthy, instead of waste. Nonetheless, there are budget trampolines that also ensure quality, efficiency, and safety all at the same time. The size of the trampoline is also a major factor to consider. Today, there are wide ranges of trampolines on the market, ranging between 6ft and 17ft in diameter. These are most likely the personal exercise varieties or the extra-large ones that can be used by couples at a time. Trampolines that are low to the ground could pose the risk of tipping over due to their small sizes, however, are ideal for small children or toddlers. Smaller trampolines could be stable enough and can hold a small jumper, although still pose a weight limit. Remember that trampoline sizes do not only attribute to the purpose, but also the area of placement. The safety features are among the top priorities while shopping for a trampoline. This is more so when the trampoline is intended for children use. Hence, the safety measures offered by different trampoline brands is a safety net that keeps the trampoline enclosed, keeping the bouncing kids from falling off the ground. Nowadays, there is the option of a no spring trampoline or the spring-less variety, which is likewise good for the family. Trampolines even with heavy-duty springs could still pose some hazards to smaller children due to mis-stepping. The overall construction of the trampoline should be strong and sturdy, usually with steel frames and legs for ample support, like the trampolines reviewed above. Besides the price, size, and safety features, the area of placement is equally an essential factor to consider. In fact, almost all factors are interconnected as the area of placement should also be an ideal place, ensuring the optimum safety of the users. The ground should be even as slight variances could pose some dangers. The frame and welds play important roles throughout your decision-making. Make sure that the trampoline is made of durable metal, checking the welds between the attached pieces. The welds should be sturdy and smooth at the same time because snags and rough welds could be notorious for cutting. Rough spots mean you need to look further! Additionally, make sure that the frame joints fit snugly together. While trampolines have varied, joint types, such as t-bracket, square, round, or triangular, those with round joints are said to be less sturdy compared to the angle-joints. Bear in mind that joint angles greatly help in preventing the frame to twist or pull apart during the bouncing of weight. If you are considering a trampoline with elastic bands, then make sure that they are securely fastened without the tendency of loosening, while the trampoline is in use. Elastic bands do not usually hold up, unlike with metal springs. Elastic bands stretch over time, losing their original elasticity. Metal springs, on the other hand, are said to be more secure. Again, the best trampolines to buy largely depends on your personal preference, available budget, and specific features. Furthermore, ensuring a padded trampoline spring cover is a must, but, it should cover all of the springs completely. Accidents like broken arms and legs could occur when jumpers land on the springs without a cover. Hence, it will always be safer when the spring covers are also fastened both to the frame and the springs. An enclosure is also a must-have, while using a trampoline. The best trampoline reviews will reveal the trampoline packages and sets that include such additional accessory. Otherwise, you can still purchase an enclosure that is compatible with your model, but, it will be best to buy one of the same brands. Meanwhile, an excellent trampoline enclosure should are installed correctly with the bottom net attached to the mat. You may see different styles of enclosures and poles on the market. Regardless of the style, it should be padded very well. Some brands have foam ‘sleeves’ in their enclosure poles, allowing the user to install them around the metal poles, adding safety measures and comfort simultaneously. As previously mentioned, almost all factors are intertwined. Thus, a netting attachment is equally essential, while purchasing the best trampoline. The majority of enclosures come with a rope that is used in sewing the netting to the frame. This type of netting attachment should be sewn exactly as what is said in the instructional guide or the owner’s manual. This will ensure that there are no gaps that pose danger, especially to small children. The international market is certainly a humongous arena to look for the top rated trampolines. However, with the above-mentioned product reviews, along with the help of customer ratings and customer reviews, you will certainly arrive at the best deal possible. Before answering the question about what is the best trampoline to buy, you must identify the specific type of trampoline that you need. Rebounder – Also referred to as a mini-trampoline, the rebounder is the smallest of all types. The compact design is ideal for indoor use, and by a single user. Jumpers also use this type in improving their heart rate through certain exercise routines. Rebounder is a type of trampoline that can be packed away and stored easily under a bed or in the closet. Olympic or Professional – This type of trampoline cannot be easily compared to its counterparts. As the name suggests, it is a large model and specifically designed for athletes that need an intense training and maximum performance. In fact, professional trampolines are specially designed for the Olympic Games, and ideal solely for highly-skilled individuals. Hence, this variety is the most expensive trampoline, costing up to $10,000 or more. Recreational Backyard Trampoline – The recreational backyard trampoline is a classic and the most popular one. This variety tends to create family memories since their production. The advancements in technology and the capacity of different trampoline brands have resulted in more enjoyable, safer, and cheaper trampolines today. Recreational backyard trampolines are also space-savers without sacrificing the quality, efficiency, and safety measures. Today, manufacturers are offering backyard trampolines, although the models greatly differ from one another. While purchasing the best trampoline for adults and kids, all the above mentioned factors are worth considering, ranging from the price to the size, safety features, and types. However, the safety features are the most important factor throughout your decision-making, ensuring that the trampoline is made of durable materials while preventing injuries and accidents at the same time. The trampoline should be tested by corresponding organizations, which ensure consumer safety all the time. Keep in mind that worth-buying trampolines should aid in creating family bonding moments and childhood memories for all family members to cherish for a lifetime! All the more, consider the trusted trampoline brands on the market, those that design trampolines not only to sell but also to meet the needs of families and comply with the national safety standards. Reading about the outdoor trampoline reviews, ratings as well as trampoline comparison will help you narrow down the choices, helping you arrive at the best deal possible while ensuring no less than an efficient, safe, enjoyable, and the best trampoline for kids and adults alike.